When Denny's Manila opened its doors last October 2016 via The Bistro Group, it caused a massive stir in social media. 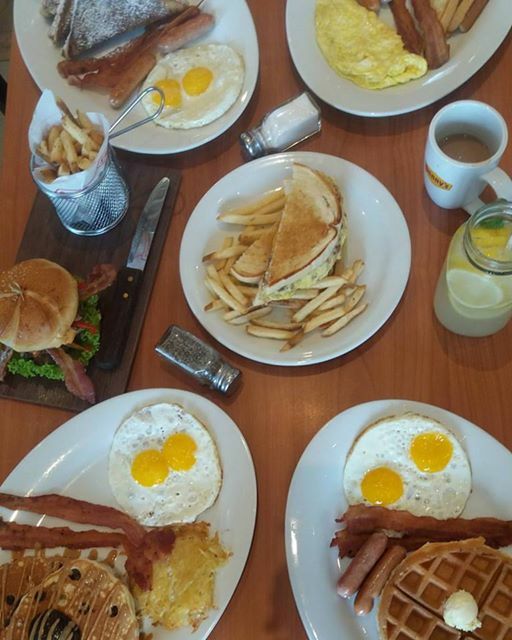 Denny's is America's 24/7 diner famous for their affordable all-day breakfast menu and people have been anticipating the grand opening of their first flagship restaurant in Manila. I joined in the Zomato meet up to sample some of their breakfast lineup. I love their take on Bourbon Bacon Burger (P 525). It is a hand-pressed beef burger with bourbon glaze, topped with cheddar cheese, bacon, sauteed mushrooms and onions burger. It comes with seasoned fries, which were the best I've had in a while. 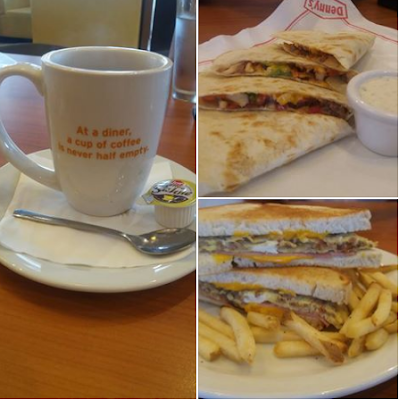 The French Toast Slam (P 385) are two French toast slices with two eggs, two bacon and two sausages. Waffle Slam (P 385) is a perfectly-done golden waffle. It comes with servings of two eggs, two bacon strips and two sausages. Quesadilla (P 395) is one of my favorites! The flour tortilla is filled with roasted seasoned chicken, crumbled sausage, bell peppers, onions plus loads of melted American cheese. 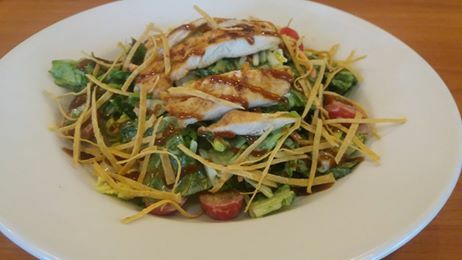 It comes with ranch dressing on the side. 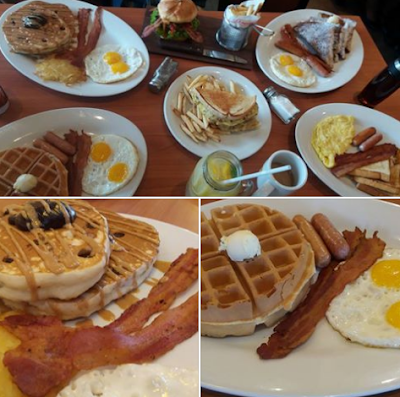 Choco Overload Pancake (P 395) makes a complete breakfast as it comes with two buttermilk pancakes, two eggs, two strips of bacon and hash brown. 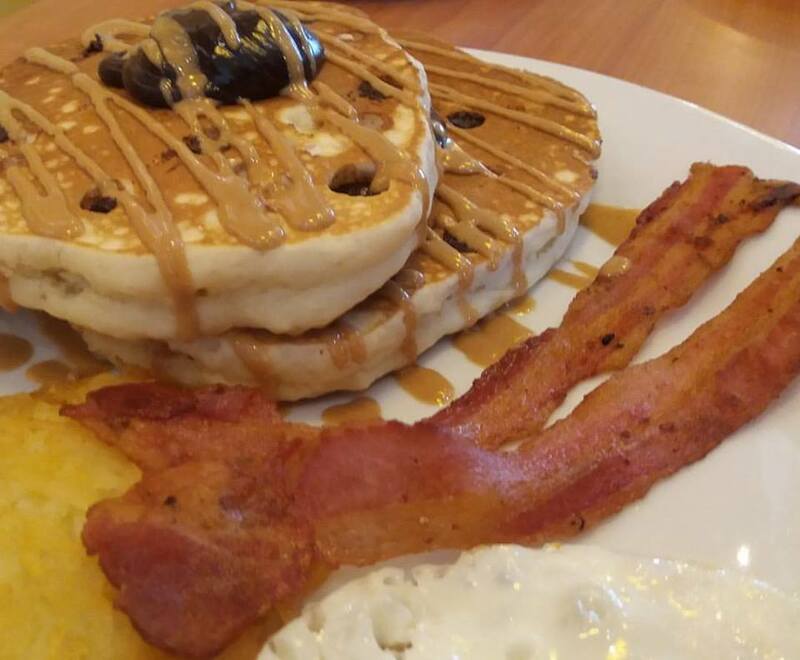 The fluffy pancakes is a sight to behold with with hot fudge on top and peanut butter sauce drizzle. When I took a bite, I was surprised to find white chocolate and chocolate chips in inside! 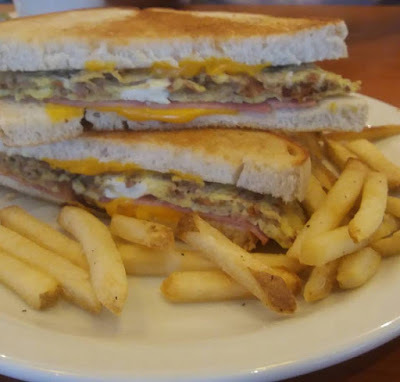 Grand Slam Wich (P 395) is another favorite of mine! It is great sandwich packed with flavor. This Slamwich is made with scrambled eggs, crumbled sausage, bacon, shaved ham and American cheese. The freshly toasted bread is served with fries. Denny's Asian Salad (P 395) is a heap of romaine lettuce tossed with cucumber, carrots, and grapes, topped with shredded nacho chips and grilled chicken breast strips. Cajun Shrimp (P 385) are shrimps mixed with bell peppers andseasoned with Cajun spice. 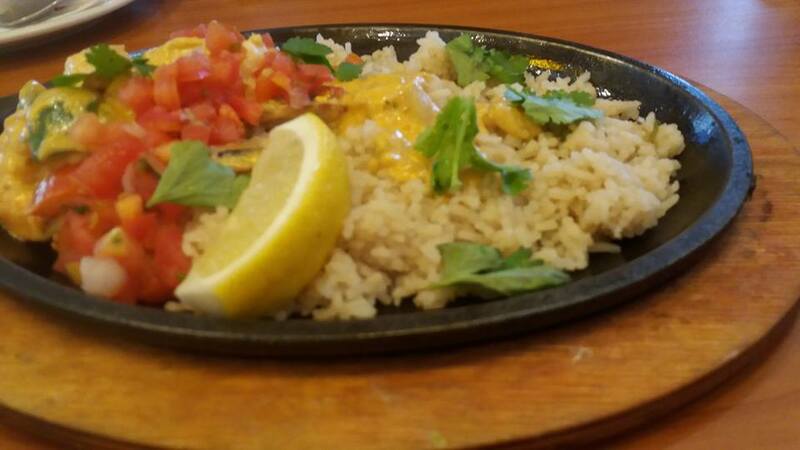 It is served with cilantro pilaf rice, topped with parsley and a lemon wedge. Aside from heir hearty toasts, slamwich, pancakes, skillets, and burgers, I also noticed a lot more variety on the menu. Their all-time menu items include Pinoy favorites like Arroz Caldo, Tenderloin "Bistek Tagalog", Beef Tapa, Crispy Bangus Belly, Pork and Chicken Adobo meals designed by Chef Josh Boutwood.